Ciprofloxacin (INN) is an antibiotic useful for the treatment of a number of bacterial infections. It is a second-generation fluoroquinolone. Its spectrum of activity includes most strains of bacterial pathogens responsible for respiratory, urinary tract, gastrointestinal, and abdominal infections, including Gram-negative (Escherichia coli, Haemophilus influenzae, Klebsiella pneumoniae, Legionella pneumophila, Moraxella catarrhalis, Proteus mirabilis, and Pseudomonas aeruginosa), and Gram-positive (methicillin-sensitive, but not methicillin-resistant Staphylococcus aureus, Streptococcus pneumoniae, Staphylococcus epidermidis, Enterococcus faecalis, and Streptococcus pyogenes) bacterial pathogens. Ciprofloxacin and other fluoroquinolones are valued for this broad spectrum of activity, excellent tissue penetration, and for their availability in both oral and intravenous formulations. Ciprofloxacin is used alone or in combination with other antibacterial drugs in the empiric treatment of infections for which the bacterial pathogen has not been identified, including urinary tract infections and abdominal infections among others. It is also used for the treatment of infections caused by specific pathogens known to be sensitive. 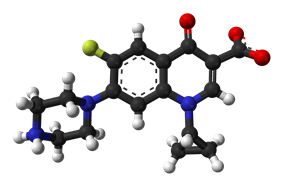 Ciprofloxacin is the most widely used of the second-generation quinolone antibiotics that came into clinical use in the late 1980s and early 1990s. In 2010, over 20 million outpatient prescriptions were written for ciprofloxacin, making it the 35th-most commonly prescribed drug, and the 5th-most commonly prescribed antibacterial, in the US. Ciprofloxacin was first patented in 1983 by Bayer A.G. and subsequently approved by the US Food and Drug Administration (FDA) in 1987. Ciprofloxacin has 12 FDA-approved human uses and other veterinary uses, but it is often used for unapproved uses (off-label). Overall, the safety of ciprofloxacin and other fluoroquinolones appears to be similar to that of other antibiotics, but serious side effects occur on occasion. Some disagreement in the literature exists regarding whether fluoroquinolones produce serious adverse events at a higher rate than other broad-spectrum antibiotics. The U.S. FDA-approved label for ciprofloxacin includes a "black box" warning of increased risk of tendon damage and/or rupture and for exacerbation of muscle weakness in patients with the neurological disorder myasthenia gravis. Two small post-marketing epidemiology studies of mostly short-term, first-trimester exposure found that flouroquinolones did not increase risk of major malformations, spontaneous abortions, premature birth, or low birth weight. The label notes, however, that these studies are insufficient to reliably evaluate the definitive safety or risk of less common defects by ciprofloxacin in pregnant women and their developing fetuses. ^ Drusano GL, Standiford HC, Plaisance K, Forrest A, Leslie J, Caldwell J, GL (September 1986). "Absolute oral bioavailability of ciprofloxacin". Antimicrob Agents Chemother. 30 (3): 444–6. ^ Ball P (July 2000). "Quinolone generations: natural history or natural selection?". J. Antimicrob. Chemother. 46 Suppl T1: 17–24. ^ Oliphant CM, Green GM; Green (February 2002). "Quinolones: a comprehensive review". Am Fam Physician 65 (3): 455–64. ^ Laurence Brunton; John Lazo; Keith Parker (23 August 2005). Goodman & Gilman's The Pharmacological Basis of Therapeutics. McGraw-Hill Prof Med/Tech. ^ Goossens H, Ferech M, Coenen S, Stephens P; Ferech; Coenen; Stephens; European Surveillance of Antimicrobial Consumption Project Group (April 2007). "Comparison of outpatient systemic antibacterial use in 2004 in the United States and 27 European countries". Clin. Infect. Dis. 44 (8): 1091–5. ^ "http://drugtopics.modernmedicine.com/drugtopics/data/articlestandard//drugtopics/252011/727243/article.pdf". Retrieved 2 November 2012. ^ a b c Heidelbaugh JJ, Holmstrom H; Holmstrom (April 2013). "The perils of prescribing fluoroquinolones". J Fam Pract 62 (4): 191–7. ^ a b Brown KA, Khanafer N, Daneman N, Fisman DN; Khanafer; Daneman; Fisman (May 2013). "Meta-analysis of antibiotics and the risk of community-associated Clostridium difficile infection". Antimicrob. Agents Chemother. 57 (5): 2326–32. ^ a b Falagas ME, Matthaiou DK, Vardakas KZ; Matthaiou; Vardakas (December 2006). "Fluoroquinolones vs beta-lactams for empirical treatment of immunocompetent patients with skin and soft tissue infections: a meta-analysis of randomized controlled trials". Mayo Clin. Proc. 81 (12): 1553–66. ^ a b Knottnerus BJ, Grigoryan L, Geerlings SE et al. (December 2012). "Comparative effectiveness of antibiotics for uncomplicated urinary tract infections: network meta-analysis of randomized trials". Fam Pract 29 (6): 659–70. ^ a b c De Sarro A, De Sarro G; De Sarro (March 2001). "Adverse reactions to fluoroquinolones. an overview on mechanistic aspects". Curr. Med. Chem. 8 (4): 371–84. ^ Vardakas, KZ; Siempos, II; Grammatikos, A; Athanassa, Z; Korbila, IP; Falagas, ME (December 2008). "Respiratory fluoroquinolones for the treatment of community-acquired pneumonia: a meta-analysis of randomized controlled trials". CMAJ 179 (12): 1269–77. ^ Donaldson, PM; Pallett, AP; Carroll, MP (May 1994). "Ciprofloxacin in general practice". BMJ (Clinical Research Ed.) 308 (6941): 1437. ^ Karageorgopoulos, DE. ; Giannopoulou, KP. ; Grammatikos, AP. ; Dimopoulos, G.; Falagas, ME. (March 2008). "Fluoroquinolones compared with beta-lactam antibiotics for the treatment of acute bacterial sinusitis: a meta-analysis of randomized controlled trials". CMAJ 178 (7): 845–54. ^ Hugh Young (22 July 2003). "Ciprofloxacin resistant gonorrhoea: the situation in Scotland and implications for therapy" (PDF). SCIEH Weekly Report - SCOTTISH CENTRE FOR INFECTION AND ENVIRONMENTAL HEALTH (Scotland: National Health Service) 37. ^ Centers for Disease Control and Prevention (CDC) (13 April 2007). "Update to CDC's sexually transmitted diseases treatment guidelines, 2006: fluoroquinolones no longer recommended for treatment of gonococcal infections.". Morbidity and Mortality Weekly Report (PDF) (USA: Center for Disease Control) 56 (14): 332–336. ^ Loebstein R, Addis A, Ho E, Andreou R, Sage S, Donnenfeld AE et al. (1998). "Pregnancy outcome following gestational exposure to fluoroquinolones: a multicenter prospective controlled study". Antimicrob Agents Chemother 42 (6): 1336–9. ^ Schaefer C, Amoura-Elefant E, Vial T, Ornoy A, Garbis H, Robert E et al. (1996). "Pregnancy outcome after prenatal quinolone exposure. Evaluation of a case registry of the European Network of Teratology Information Services (ENTIS)". Eur J Obstet Gynecol Reprod Biol 69 (2): 83–9. ^ Shin HC, Kim JC, Chung MK, HC; Kim, JC; Chung, MK; Jung, YH; Kim, JS; Lee, MK; Amidon, GL (September 2003). "Fetal and maternal tissue distribution of the new fluoroquinolone DW-116 in pregnant rats". Comp. Biochem. Physiol. C Toxicol. Pharmacol. 136 (1): 95–102. ^ Dianne Murphy (30 August 2000). "Cipro Labeling Revision Letter 08/30/2000 Supplement 008 New or Modified Indication". U.S. Food and Drug Administration. ^ Renata Albrecht (25 March 2004). "Cipro Labeling Revision Letter 03/25/2004 Supplement 049 Patient Population Altered". ^ Saint, F; Gueguen; Biserte; Fontaine; Mazeman (September 2000). "Rupture of the patellar ligament one month after treatment with fluoroquinolone". Revue de chirurgie orthopedique et reparatrice de l'appareil moteur 86 (5): 495–7. ^ van der Linden PD, Sturkenboom MC, Herings RM, Leufkens HG, Stricker BH; Sturkenboom; Herings; Leufkens; Stricker (June 2002). "Fluoroquinolones and risk of Achilles tendon disorders: case-control study". BMJ 324 (7349): 1306–7. ^ Corrao G, Zambon A, Bertù L et al. (2006). "Evidence of tendinitis provoked by fluoroquinolone treatment: a case-control study". Drug Saf 29 (10): 889–96. ^ Deshpande A, Pant C, Jain A, Fraser TG, Rolston DD; Pant; Jain; Fraser; Rolston (2008). "Do fluoroquinolones predispose patients to Clostridium difficile associated disease? A review of the evidence". Curr Med Res Opin 24 (2): 329–33. ^ Alshammari TM, Larrat EP, Morrill HJ, Caffrey AR, Quilliam BJ, Laplante KL; Larrat; Morrill; Caffrey; Quilliam; Laplante (2014). "Risk of hepatotoxicity associated with fluoroquinolones: A national case-control safety study". Am J Health Syst Pharm 71 (1): 37–43. ^ a b "Cipro Immediate Release Tablets Prescribing Information". ^ Iannini, PB (June 2007). "The safety profile of moxifloxacin and other fluoroquinolones in special patient populations.". Current medical research and opinion 23 (6): 1403–13. ^ Owens Rc, Jr; Ambrose, P. G. (July 2005). "Antimicrobial safety: focus on fluoroquinolones". Clinical Infectious Diseases. 41 Suppl 2: S144–57. ^ "Cipro Labeling Revision 02/25/2011 Supplement 075". ^ CIPRO® (ciprofloxacin*) ORAL SUSPENSION"
"CIPRO® (ciprofloxacin hydrochloride) TABLETS (PDF). ^ Rodvold KA, Piscitelli SC; Piscitelli (August 1993). "New oral macrolide and fluoroquinolone antibiotics: an overview of pharmacokinetics, interactions, and safety". Clin. Infect. Dis. 17 Suppl 1: S192–9. ^ a b c d "Cipro Labeling Revision 04/06/2009 Supplement 073". US Food and Drug Administration. 6 April 2009. Retrieved 8 September 2009. ^ a b Bolhuis MS, Panday PN, Pranger AD, Kosterink JG, Alffenaar JW; Panday; Pranger; Kosterink; Alffenaar (2011). "Pharmacokinetic drug interactions of antimicrobial drugs: a systematic review on oxazolidinones, rifamycines, macrolides, fluoroquinolones, and Beta-lactams". Pharmaceutics 3 (4): 865–913. ^ a b c "Cipro Labeling Revision 10/03/2008 Supplement 068". US Food and Drug Administration. 3 October 2008. Retrieved 31 August 2009. ^ Janknegt R, R (November 1990). "Drug interactions with quinolones". ^ Shahzadi A, Javed I, Aslam B et al. (January 2011). "Therapeutic effects of ciprofloxacin on the pharmacokinetics of carbamazepine in healthy adult male volunteers". Pak J Pharm Sci 24 (1): 63–68. ^ Drlica K, Zhao X, K; Zhao, X (1 September 1997). "DNA gyrase, topoisomerase IV, and the 4-quinolones". Microbiol Mol Biol Rev. 61 (3): 377–92. ^ Pommier Y., Leo E., Zhang H., Marchand C. (2010). "DNA topoisomerases and their poisoning by anticancer and antibacterial drugs". Chem. Biol 17: 421–433. ^ "Cipro IV Prescribing Information". ^ "Cipro XR Prescribing Information". ^ United States Court of Appeals for the Federal Circuit (2008). "United States Court of Appeals for the Federal Circuit" (PDF). USA. Retrieved 4 September 2009. ^ "Bacterial resistance prompts concern among health officials". 26 February 2009. ^ "Update On Extra-Label Use Of Fluoroquinolones" (Press release). ^ a b Linder JA, Huang ES, Steinman MA, Gonzales R, Stafford RS; Huang; Steinman; Gonzales; Stafford (March 2005). "Fluoroquinolone prescribing in the United States: 1995 to 2002". Am. J. Med. 118 (3): 259–68.